Verethraqna was one of the principal gods from Ancient Iran and Iranian world in general from the time of the Achaemenids. Apparently he survived the Zoroastrian reform form a previous cult, acquiring total relevance and a quite high position inside the pantheon with the new religion. He has been compared to Herakles and Ares in Seleucid period due to Hellenistic influence, fundamentally due to his principal attributes as hypostasis of Victory and for being known as the one who cannot be defeated in combat. Other names for him are Warharam, Vehram or Bahrām, as he is mostly known. Indian and Iranian worlds have always been closely related and the case of Verethraqna makes no exception. It is possible to trace the relation this character has with Vedic religion, the myth of god Indra and the serpent-monster Vṛtra most precisely. However, Major Rafnt wrote in 2015 the theory of Indo-Iranian origins of Verethraqna was not followed anymore. The adjective is not exclusive for the Victory spirit but also used to define other characters, both gods and heroes, and has its correspondence with the Vedic word vṛtrahán, famous epithet for god Indra. Among all his great deeds one of the most important victories of this god was smiting monster Vṛtra in a battle for the releasing of the creation waters, strongly parallel to the one fought between Tištrya and Apaoša. One of the theories regarding to the connection between Verethraqna and Indra proposes the former to be an echo of the latter, that is to say, with the religious reform of Zoroastrianism the epithets of the Vedic god would have been taken to build and magnify the figure of the Iranian god, stripping the dragon-slaying features. The second stronger theory stands that originally were two characters in Indo-Iranian world: the god and the dragon-slayer. Zoroastrianism would have stayed with the divine figure whereas Indie preferred to give supremacy to Indra as depicting him as monster murderer. From both theories, Gherardo Gnoli chooses the first to be more possible, taking under account the main function of Indra was not killing dragons but hits was an addition. Nevertheless, the topic of the link Indra-Verethraqna is still a matter of discordances and many other theories exist about if it is possible to relate them or not. They cannot be described entirely, but can be found in the bibliography, in case someone is interested. The spirit of Victory has his own hymn inside the Avesta, Zoroastrian sacred texts, which is commonly known as Bahrām Yašt and is the number 14 inside the compilations list. As in other yašt, it describes exhaustively this god and his characteristics. It is one of the most ancient sections inside the scriptures known as Young Avesta, although it seem to be composed as a patchwork as Christensen studied. The scholar ended up concluding it is quite complicated to establish the difference between the parts belonging originally to Bahrām Yašt and what was taken from other hymns. Mary Boyce wrote that even if it was not totally preserved, it contains what seem to be archaic elements that lead to think about the true antiquity of this god and his cult. · A furious wind (Yt. 14.2-5). This is the initial form and the one with he comes to Zarathustra as the strong, the victorious and the chosen one. In addition these verses refer to his ability to heal and his relation with medicine. · A bull with golden horns (v. 7). Upon these horns it is said to rest the Strength and the Victory, being them the ones who shaped the bones and covered them with gold. · A white horse with golden ears and golden muzzle (v. 9). Here the previous description is repeated, being the virtues of the god floating upon the animal’s forehead. · A camel (v. 11-13). The text depicts it as ready to mate with females, what highlights the sexual potency of the god and his patronage upon masculine virility. It is also linked to humans saying he lives among the abodes of men as part of the cattle, which he cares for as well, referring to its prosper reproduction. · A boar (v. 15). 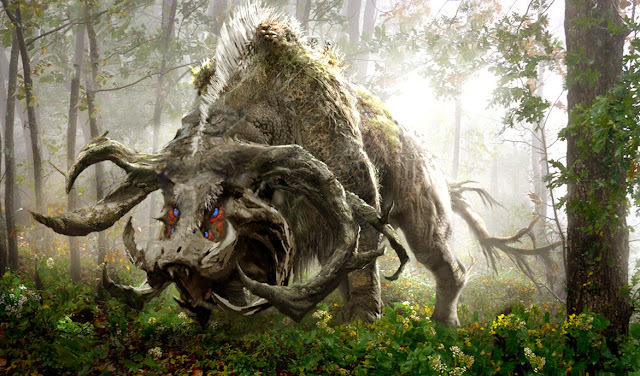 This animal holds a special description since it is not a current wild boar but a kind of both fantastic and monstrous creature with several lines of sharp fangs and even horns. It is also a quite fast creature. · A fifteen years old youngster (v. 17). Here describes his beauty and innocence alluding to the purity of his «clean» eyes. · A falcon, raven or bird of prey (v. 19-21). This is one of the most famous forms, since it is described as the swiftest of birds, able to overtake the speed of an arrow. Its flight determines the night turning into day and its feathers have magical properties. · A ram (v. 23). This ram possesses an incredible strength which uses charging with its rounded horns. · A wild goat (v. 25). The horns of this goat are sharpened and ready for combat. The agility of the god to move in mountain territory is emphasised as well. · An armed grown up warrior (v. 27). When Verethraqna finally presents himself as a man, he is described as completely armoured to face combat, with a shield and a golden blade sword inlaid with all sort of ornaments. Some of these metamorphoses are not exclusive of Verethraqna. For instance, Tištrya could acquire the shape of the youngster, the bull or the horse (Yt. 8.13,16,20), the Xᵛarənah or Glory could appear as a raven (Yt. 19, 35) and the Wind divinity, Vayu-Vāta, presented himself as a camel or as an impetuous wind (Dk, IX, 23.2-3) . After couting the incarnations, the X continues with the list of gifts the spirit awards Zarathustra with, beint the most important one the victory through thought, action and word. The latter refers to habitual rhetoric duels dating back from Indo-Iranian times. As any other god, Verethraqna must be offered libations in the shape of sacred twigs and what Dhalla describes as «consecrated cooked repast of cattle», white if possible. However, not everybody could offer these presents to the god; only the virtuous and pure-hearted should do so. Calamity and disaster will befall upon those who dare to conjure the god being wicked, or upon the righteous who share those libations with the enemy. 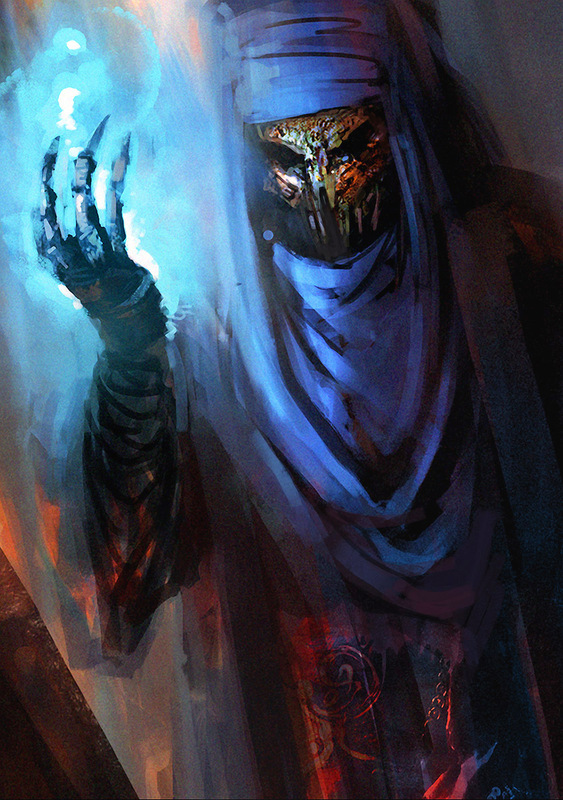 The texts describe the plagues will devastate their lands, illness will kill their families and Verethraqna himself will cut their hands and feet after depriving them from sight and hearing. The intention of depicting the god as a powerful creature that must be respected and venerated but also feared for the terrible of is wrath is clear. Georges Dumézil wrote: «in Indo-Iranian theology, the functions and functional gods were juxtaposed, thus justifying different moral codes for the different human groups». This indicates society was divided in different groups protected by diverse divinities as they had specific needs. 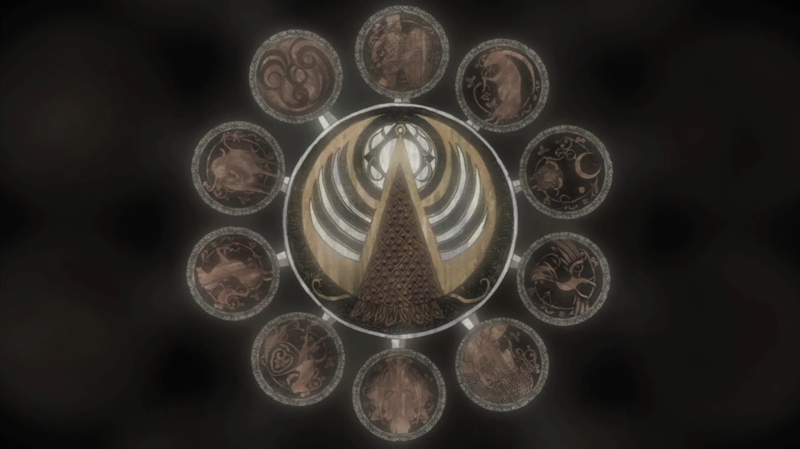 Verethraqna, as one of the most prominent creatures of the pantheon, should cover all these groups one way or another. As a representation of Victory he is directly related with military world, strength and combat skills. The evidences are the transformations that allude to his warrior behaviour, such as the bull, the ram, the goat or the boar. Nonetheless, not all his power had to do with fighting. For example, the shape of a camel referred to its patronage upon masculine virility and sexual potency, and the wind describes as well he has the ability to heal. 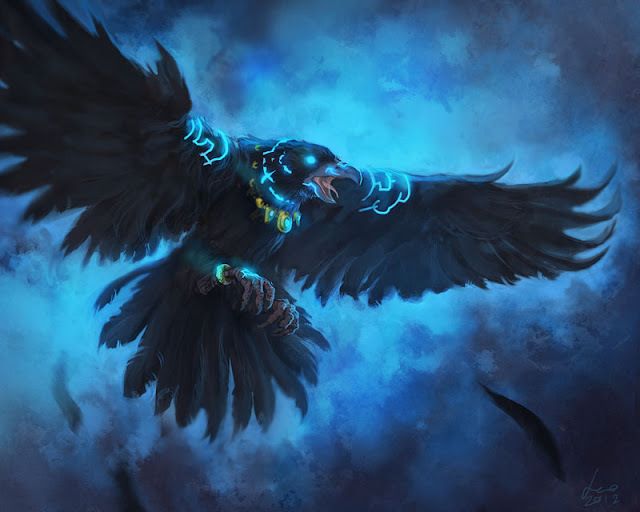 Furthermore, the magic on his feathers in the raven shape links Verethraqna with magical elements used in shamanic rituals and exorcism, with the majority of the parallels located in India. 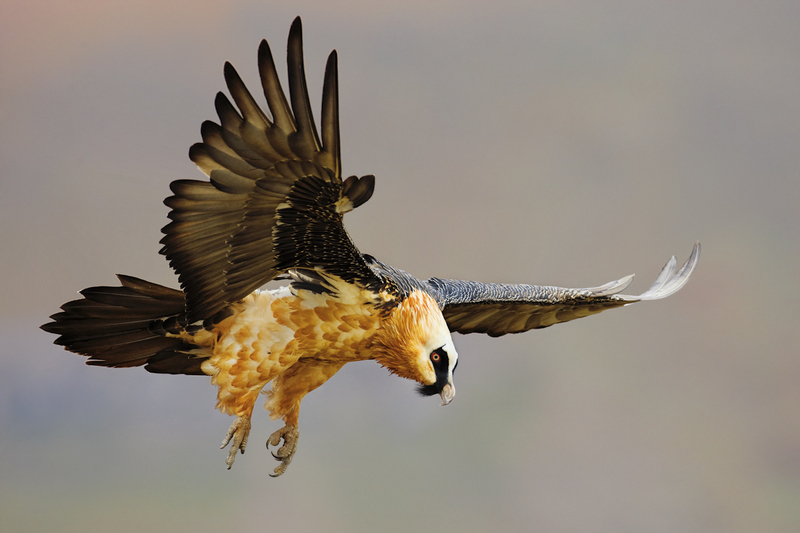 There existed certain oracles based on the movements described by the falling of a falcon or raven feather. The ten incarnations did not only refer to physical strength nor his warrior skills; six out of ten are shapes adopted for the race, alluding to speed and agility —the wind, the horse, the camel, the boar, the youngster, the raven—. Verethraqna is considered a total spirit in the sense of his popularity and relevance among other Zoroastrian creatures made necessary he could cover all the functions previously described, making his position before the worshipers clear. In an advanced moment of the cult, Sasanian period already, he was made patron divinity of travellers. The Zoroastrian reform and the passing of the time had great influence in this god, making him developing towards a more intellectual personality and making his actions more moral than literal. According to Raftn he appears in the crowns of the Sassanian kings as a bird of prey or only depicted through his wings. 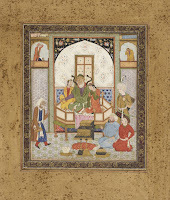 There is a text, translated by Jean de Menasce, where Verethraqna is promoted to the category of Amesha Spenta, the Glorious Immortals accompanying Ahura Mazdā, cited by Dumézil. Inside the Zoroastrian cult, Verethraqna holds a very important connection with two other divinities: Mithra and Čistā, who represents the Sacred Conciousness —a role that later on will be in the hands of Daēnā —. At the Mihr Yašt, dedicated to the solar divinity, Verethraqna appears beside him in his terrible boar shape, willing to punish with the cruelty aforementioned those who dare to lie to Mithra, who also represents the sacred oath. According to Avesta, Verethraqna and Čistā would be both companions of Mithra, and among their liturgies several connections can be found. Those three animals appear as connected to Čistā at the Dēn Yašt (number 16). Thus Verethraqna is linked to the cosmos entirely. As Georges Dumézil wrote: «This is another rendition of the god's special relation to the entire cosmos, a necessary attribute for him since, on the one hand, the only truly effective victory must be a total one, and, on the other, the universe, highly interested in the assailant god's victory, must contribute to it with all its elements». 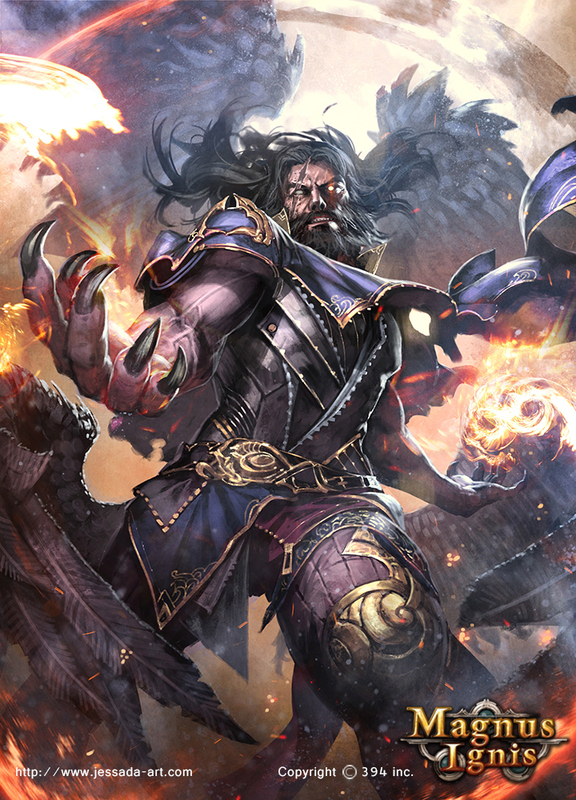 Japan has shown an increasing interest for Zoroastrian mythology and Verethraqna makes no exception. In the Japanese animated series Campione!, the main characters receives from Verethragna, a little powerful god of war, the ability to transform himself in ten different things to complete his mission. One of the images of the series shows a circle with the ten corresponding discs, that mix an iconography that goes from Mesopotamian to Greek, as well as his opening, where they appear one after the other and in the same order they do inside the yašt. CHRISTENSEN, Arthur E.: Études sur le zoroastrisme de la Perse antique, Copenhagen, 1928. RANFT, Major: The Esoteric Codex: Zoroastrian Legendary Creatures. Lulu.com, 2015. RAFNT, Major, op. cit., p. 111. GNOLI, Gherardo, op. cit., p. 1. Ibídem, p. 2. DUMEZIL, Georges, op. cit., p. 117-118. CHRISTENSEN, Arthur, op. cit., pp. 7-8. BOYCE, Mary, op. cit., p. 63. GNOLI, Gherardo, op. cit., p. 2. DHALLA, Maneckji N., op. cit., p. 194-195. DUMÉZIL, Georges, op. cit., p. 115. GNOLI, Gherardo, op. cit., p. 3. DUMÉZIL, Georges, op. cit., p. 129. BOYCE, Mary, op. cit., p. 62. DUMÉZIL, Georges, op. cit., p. 119-120. DHALLA, Maneckji N., op. cit., p. 195. DUMEZIL, Georges, op. cit., p. 131.